Ultra packable, Mavic’s Helium vest offers possibly the highest protection to weight ratio of any vest, whether it is for a spring breeze, an alpine descent, or a brief shower. 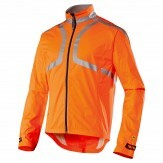 Mavic Vision jackets and vests are the perfect companions for cold, wet, overcast, and low-light rides. The VIZ + technology provides maximum visibility in low light situations.